Inné agus mé ag glacadh páirte i siulóid urraithe ar son Scoil Náisiúnta Chúil Aodha, agus lá alainn a bhí ann don siúlóid, thánag ar an bpostaer seo ó Fhine Gael, cáite sa dhíog. Is minic go mbionn Gaeilgeoirí tarcaisneach i leith an pháirtí seo mar gheall ar easpa choimitmint don teanga – ach tá an Chomhairleoir seo, Michael Creed, le moladh as an iarracht atá déanta aige. Go deimhin, os rud é gur postaer é seo atá bunaithe ar theimpléid ón lár oifig, ní foláir ach go bhfuil moladh ag dul don pháirtí freisin. I mBéarla amháin atá postaer FG don toghchán Eorpach ar son Colm Burke agus Seán Kelly. Tá postaeir ag iarrthóir Eorpach FF sa thoghcheantar, Brian Crowley, agus is i mBéarla go h-iomlán atá siad. Agus níl ach focal amháin Ghaeilge ar phostaeir SF don toghchán áitiúil – Votáil Des O’Grady 1. Agus níl focal Ghaeilge ar phostaer Toireasa Ferris – níl aon focal ann seachas ‘Sinn Féin’ (agus fagaimíd ainmneacha na bpairtithe as an áireamh) agus ainm an iarrthóra. Postaeir i mBéarla amháin atá ag an iarrthóir don Lucht Oibre sa cheantar, Martin Coughlan. Níl aon rian go fóill ar phostaeir iarrthóír an Lucht OIbre sa Toghchán Eorpach i Múscraí – cé go bhfuil na postaeir thuas le fada i gceantaracha eile sa toghcheantar. Foilsiú: 11/05/2009 . igaeilge a d’fhoilsigh. Ranganna: An Ghaeilge, Cúrsaí Reatha, Nuacht. Clibeanna: An Lucht OIbre, Colm Burke, Des O'Grady, Fine Gael, Martin Coughlan, Michael Creed, Sean Kelly, Sinn Féin, Toireasa Ferris. Gaeilge na bpolaiteoirí agus na poilíní teanga…. Seo sliocht i nGaeilge ó oráid Enda Kenny, ceannaire Fhine Gael ag an deireadh seachtaine. Chuir sé isteach orm go mór gur dúnmharú triúr sa Tuaisceart le deanaí. Ar mo mholadh féin, ghlac Dáil Éireann le rún comhbhrón agus bhí tacaíocht ó chuile pháirti i gcoinne an feall sin. Chuir an Dáil amach teachtaireacht láidir don Teach Bán, do mhuintir na hEorpa agus don domhain ar fad nach glacann muintir na hÉireann, Tuaisceart agus Deisceart, leis an eacht úfásach sin. Caithfear deireadh a chur le seo laithreach. D’oibrigh an iomairce daoine ró dian agus ró fhada chun go ligfear go dtosnodh an troid sin arís. Leanfaimid ar aghaidh le síocháin seasamach as seo amach. Agus seo míreanna ó oráid John Gormley, Ceannaire, An Chomhaontas Ghlas, ag comhdháil bliantúil a phairtí an mhí seo chaite. Cuireann aois an pháirtí iontas ar go leor daoine atá den tuairim gur páirtí nua an é an Chomhaontas Glas. Bíonn iontas orthu go bhfuil muid ar an bhfód beagnach aon triú cuid do stair na tíre seo. ar an 30ú Dáil.Is léir do chách go bhfuil an Rialtas ag plé le géarchéim eacnamaíochta atá ar leibhéal domhanda faoi láthair . . . D’éirigh leis an Comhaontas Glas chuid mhaith d’ár bpolasaí féin a chuir chun cinn. Leanfaidh muid leis an obair seo mar go gcreideann muid gurb chun leasa na Tíre na polasaí atá againn. Is oth liom, agus muid ar fad ag iarradh teacht i dtír an ngéarchéim atá linn faoi láthair, go bhfuil páirtí an fhreasúra ag baint úsáid polaitíochta as seo. 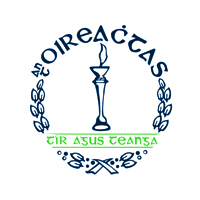 Tá mise don tuairim gurb fhearr i bhfad dóibh, agus don Tír, iarracht a dhéanamh anois tarraingt ar na maidí leis na páirtí eile ar fad san Oireachtas. Ag tús mhí na Márta a bhí Ard Fheis Fhianna Fáil agus ba seo an mhéid i nGaeilge a bhí le rá ag an dTaoiseach, Brian Cowen, agus é ag tabhairt oráid na hUachtarántachta ag an ocáid sin. Comhghairdheas. Tá muid agus lucht oibre na hÉireann buíoch daoibh as an méid atá déanta agaibh. Ag an uair deacair seo tá sibhse de dhíth go mór mór ar mhuintir ár dtíre. Ádh mór oraibh uilig. Agus ná déanaigi dearmad. Bígí láidir agus beidh cumhacht agaibh. Agus caithfidh muidne agus caithfidh pobal uile na hÉireann cruthú nach sinne amháin na daoine a bheas thíos leis an tubaiste seo. Caithfidh muid cinntiú go mbeidh na daoine santacha a chruthaigh an deacracht seo go mbeidh siadsan ag íoc as anois. Go dtí seo d’éalaigh siad saor. Le cupla bliain anuas nuair a tharraing muid aire ar an phrácás bhí ár gcairde sna meáin ag spochadh asainn. Dúirt na polaiteoirí eile nár thuig muid cúrsaí airgeadais! Cá bhfuil na fir glice seo anois? Tá rud éigin lófa fán chóras airgeadais, ní amháin ar an oileán seo ach ar fud an domhain iarthar. Ach tá cúrsaí níos measa anseo, b’fhéidir mar gheall ar an stair atá againn agus an bochtanas a chonaic muid rómhaith le tríocha bliain anuas. Tá shin millteanach dona agus mí cheart. Níl sé cothrom agus tá réitigh agus stráteisí ag Sinn Féin ar an ghéarchéim seo. Cuirfidh muid stad air. • Tá maoiniú do tograí teanga agus pobal; níl go leor ann ach tá Sinn Féin ag deanamh ár ndiceall níos mó a fháil. Agus bith cinnte faoi Acht na Gaeilge.Beidh Acht na Gaeilge ann. Tá plean againn ach ní féidir an obair seo a dhéanamh gan cairde agus comhghuallaithe ag seasamh linn agus ag cuidiú linn. Mar a dúirt mé tapaigí an deis labhairt agus éisteacht le daoine faoi na rudaí atá tabhachtach dóibh. Agus déanfaidh muid sin. Ar fud na tíre beidh Sinn Féin ag obair libh. Tá dea-thoil an domhain uilig ag dul leis ach tá brú mór air agus dóchas iontach ag brath air fosta. D’amharc muid ar an teilifís agus léigh muid inár nuachtáin fán chosmhuintir i nGaza agus d’fhulaing muid leo. Tá muid cinnte de go dtig réiteach a fháil ar an choimhlinct sa réigiún má bhíonn an toil ann. Tá obair maith ag dul ar aghaidh sa pháirtí le cur chun cinn na Gaeilge, go háirthe leis na cumainn gaelacha. Ach tá alán le déanamh go fóill. Tá sár obair déanta againn. Tá an teanga beo mar tá sibhse ag obair ar son cúis na Gaeilge. Tá muid buíoch daoibhse go léir. Bhailigh muid le chéile sa chathair seo ceithre seachtain ó shin – sa Teach Ardmhéara do cheiliúrú ar an Chéad Dáil, nócha bliain ó shin. Oíche speisialta a bhí ann má bhí tú ábalta fáil isteach! Bhí an áit plodaithe. Tá raon nua deiseanna ag oscailt dúinn. Agus ní mór dúinn bheith reidh. Ní raibh focal i nGaeilge in oráid Éamon Gilmore ag Comhdháil Bhliantúil Pháirtí an Lucht Oibre. Tá cúpla ceist agam ag eascairt as an méid thuas luaite. Tá cúpla rud soiléir. Bhí níos mó Ghaeilge in oráid Gerry Adams ná mar a bhí ag aon cheannaire eile. Ní raibh ach cúpla focal ag Brian Cowen agus ag Enda Kenny. Chuir John Gormley íontas orm leis an méid Ghaeilge a bhí ina oráid uachtarántachta. Bheadh locht ag poilín teanga ar gach oráid acu as ucht an méid botúin gramadai is litrithe a bhí sna h-oráidí. Sa deireadh thiar, áfach, léirigh siad go raibh fonn orthu úsáid a bhaint as an nGaeilge. Bhí siad sásta dul sa seans cé ná raibh an Ghaeilge acu go líofa. Is cinnte agus na h-oráidí á léamh againn i solas an lae, go mbeadh ábhar imní ann do mhúinteoir Ghaeilge. Ag an am céanna, deirtear sa Bhéarla, the perfect is the enemy of the good. Má chaithimíd le na ceannairí seo go tarcaisneach, mar ar caitheadh liomsa an tseachtain seo chaite, an é an toradh a bheidh ar an scéal nach mbeidh aon Ghaeilge in aon chorr sna h-oráidí an bhliain seo chughainn? Sa deireadh thiar thall, is beag an méid Ghaeilge atá in úsáid ag na ceannairí seo agus níl aon uirlis éifeachtach againn chun tabhairt orthu níos mó a úsáid. Cad is féidir déanamh chun an bunfhadhb seo a réiteach? Nó mura mbionn an Ghaeilge á úsáid ag na ceannairí, ní thuigfidh lucht a leanta go bhfuil tabhacht lei. Mura gcreideann lucht a leanta go bhfuil tabhacht lei, ní bhainfidh na cinnirí úsáid aistí. Fainne fí foirfe. Agus pé rud eile ar féidir a rá, ní chuidíonn an bhéim atá i réimse áirithe de shaol na Gaeilge ar ‘fhoirfeacht’ teanga agus an teanga a chosaint ón bhagarit lasmuigh le cas na Gaeilge. Foilsiú: 06/04/2009 . igaeilge a d’fhoilsigh. Ranganna: An Ghaeilge, Cúrsaí Reatha, Nuacht. Clibeanna: An Chomhaontas Ghlas, An Lucht OIbre, Fianna Fáil, Fine Gael, Sinn Féin. Fuaireas teachtaireacht r-phoist ó Bhrian Cowen, An Taoiseach, ar maidin. Tá saghas taithí agam ar theachtaireachtaí a fháil ó dhaoine cumhachtacha nó is minic, freisin, go bhfaighim teachtaireacht ón Uachtarán Barack Obama. Ar aon nós, fuaireas teachtaireacht ó Bhrian Cowen ar maidin agus bhí sé ag fiafraí díom an raibh aon cheisteanna agam do. An chéad cheist atá agam: Cén fath go bhfuil an teachtaireacht seo go léir i mBéarla? Nach tusa an Taoiseach a bhaineann úsáíd as an nGaeilge go rialta id oráidí? Nílim ag lorg teachtaireacht iomlán i mBéarla – díreach cúpla abairt nó alt chun a chur in iúl dom nach bhfuil tú tar éis í a ligint i ndearúd. Gan amhras thuigfinn go bhfuil tú faoi bhrú – ach dar liomsa is cuid den réiteach í an nGaeilge, seachas cuid den bhfadhb. Ireland’s economy has been damaged by the global economic downturn. I have been honest with the country and acknowledged that the times ahead will be tough. While we work night and day to get Ireland through these difficulties, I want to engage with you directly, so that you know what we’re doing. That’s why, in launching a new Fianna Fail website, I want to offer you an opportunity to ask me directly about the challenges we face and the route that I’m proposing to get Ireland back onto the path of sustained economic growth. Ireland is facing economic conditions unlike any we’ve seen before. Our banks required government support. Unemployment across the country is rising and many businesses are being hit hard. The public finances have suffered and we’ve been forced to make really tough choices. We’ll meet these challenges head on. We’ll fix our banking system. We’ll make sure that a new regulatory system is put in place that the people can have confidence in. We’ll help people to retrain if they become unemployed. We’ll extend further help to businesses for whom credit is no longer available and whose future is under threat. We’re taking tough decisions now, so that Ireland can emerge from this recession quickly and fairly. We’re building Ireland for tomorrow – and a better future for us all. I’ll admit we haven’t got everything right, and if you want to tell me where you think we can improve our proposals or offer alternatives, I’ll listen. Only by listening to each other, learning the lessons of recent times and working together – summoning a national effort – will we move back towards the levels of economic growth which have made Ireland the envy of many over the past 20 years. Níl a fhios agam an chuideoidh a leitheid seo d’admháil: I’ll admit we haven’t got everything right, and if you want to tell me where you think we can improve our proposals or offer alternatives, I’ll listen. le Fianna Fáíl teacht aniar sna pobal bhreitheanna. De reir an suirbhé is déanaí, níl ach duine as gach deichniúr a cheapann go bhfuil an Rialtas ag déanamh dea oibre agus iad ag iarraidh sinn a thabhairt slán ón bpriacal seo. De reir an suirbhé céanna, tá tacaíocht de 42% ag malairt rialtais den éite clé ina mbeadh An Lucht Oibre(22%), Sinn Féin (7%) agus na Glasaigh(5%), maraon leis na neamh-spleaigh(10%). 52% de thacaíocht atá ag An Lucht Oibre agus Fine Gael (30%) le cheile, 55% atá ag Rialtas Náisiúnta d’Fhianna Fáil (25%) agus Fine Gael. 42% – sin isteach is amach leis an tacaíocht a bhí ag Fianna Fáil agus iad ag dul i mbun Rialtais an uair dheireannach – ach gan dabht bhí cúpla duine sa bhreis uatha agus bheadh ar a leitheid seo de chomhghuaillíocht iad san a fháíl, bunaithe ar anailís ar fhigiúirí an lae inniu, ó Fhianna Fáil nó ó Fhine Gael. Cá bhfios, áfach, cad a tharlóidh idir seo agus trath toghcháin – ach b’fheidir go mbeidh sé níos túisce ná mar atáimíd – agus Brian Cowen – ag ceapadh. Foilsiú: 27/02/2009 . igaeilge a d’fhoilsigh. Ranganna: An Ghaeilge, Cúrsaí Reatha, Nuacht. Clibeanna: An Lucht OIbre, An Taoiseach, Brian Cowen, Fianna Fáil, Fine Gael, Sinn Féin.